This is Assassin's Creed Odyssey expansion pack. 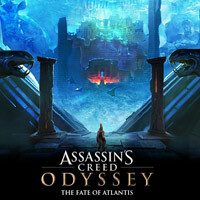 The Fate of Atlantis is the second DLC to Assassin's Creed Odyssey. Like the first expansion, the Legacy of the First Blade, the add-on was divided into episodes, and it was developed under direction of Ubisoft. In Assassin's Creed Odyssey: The Fate of Atlantis Alexios and Kassandra find themselves in a mythical sunken city. Protagonists must not only confront the divine beings living in the ancient area, but also discover the secrets of the first civilization. In Assassin's Creed Odyssey: The Fate of Atlantis there are new locations that players can visit during the game and a set of new quests that can be completed. In addition, players may encounter new enemy types and find new items in this expansion pack. The Fate of Atlantis is a typical DLC add-on, so it requires the basic version of the Assassin's Creed Odyssey to work. DLC does not change the audio-visual aspect of the original title.